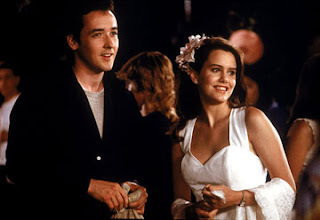 One of the moments I love the most from Say Anything is when Ione Skye and John Cusack are sitting in a mall restaurant eating and she explains that she wishes good stuff and bad stuff wouldn't come all at once, couldn't they just make a schedule? It's true, isn't it? You find yourself up and down on the seesaw of life and the changes can come in the blink of an eye. It's hard for someone like me to handle. I walk into the ocean slowly, one hard won inch of frozen skin at a time. On Friday I had a fantastic voice lesson. They're all good, believe me, but she works me hard. Sometimes I've done things I didn't know I had in me. I can be a little shell shocked. This time I was walking on air. It wasn't that I hadn't worked plenty hard, but I'd nailed all the things I'd been afraid of nailing. I think I moved to the next level. I was nearly skipping as I headed out of the building, turning my phone back on and checking email. One of those emails told me that my friend, Michael, was catastrophically ill and in the ICU at a nearby hospital. It's strangely lucky that it would come on a day when I was a mere 15 minute ride from that hospital. I got on a bus and went to see him. I've done my share of end of life visits but this one was, I have to admit, very hard. I feel strongly that he was able to hear me but suspect he couldn't see me and having him respond was out of the question. I spent about half an hour with him then wandered out and finally home to walk my dog. Yesterday while I strolled through a hipster craft fair, thanks to the miracle of modern technology, I got a text letting me know that Michael had passed just before midnight Friday. I'm so glad I was able to see him that day. I'm certainly not Michael's best friend. There was plenty that we didn't know about each other's lives. For the last 4 years, though, we have met on average twice a month to see a movie matinee. We are, unquestionably, part of each other's narrative. I had struggled a bit with having my voice lessons twice a month on Fridays as it reduced our opportunities. This weekend has been quite the seesaw ride. Next Friday I'll be taking in a movie with another friend of Michael's in our own private memorial. In the tradition of our 117 Hudson pet memorials I ask that this week you treat yourself to something, however large or small, in honor of Michael. I think he'd like that. So sorry to hear, and so very glad you got to see him. Will do, and may the memories be more powerful than the sorrow. How is we are now old enough to have friends getting I'll and passing away?!? I believe in my heart of hearts that he new you were there and that you love him.